Outrun with the power of a potato. Outrun with the power of a potato. Based on the Potato Dark theme with CSS bits inspired by Dusk. 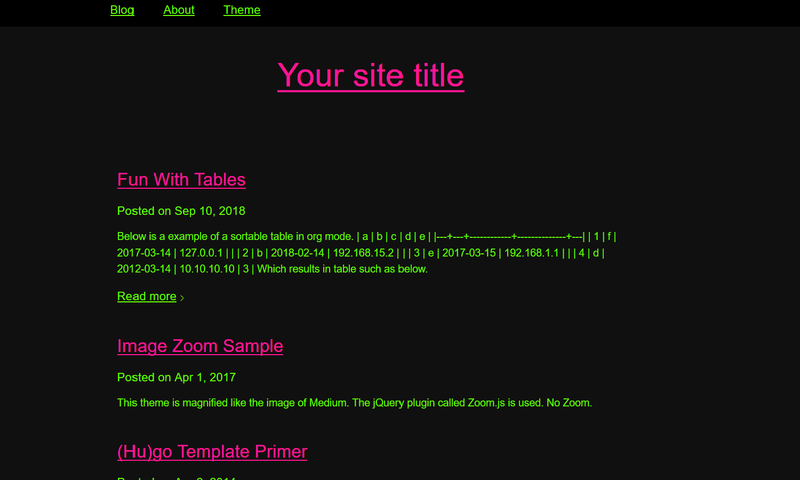 Inlined CSS for customizable colors via config. Outrun inspired foreground colors on a dark background, by default. The ability to enable sorting of tables for pages. So lets say you have a page you don’t want pagination displayed, such as “About.org”, then you can set no_pagination to true in the Front Matter and it won’t display. So lets say you want to make the tables on a page sortable, you can now do this. You can do this, by setting the Front Matter value “sort_tables” to true and in the header it will include a link to a JS script in the js dir that does this. Below is a org mode example with sortable tables.